Imagine a church wracked by divisions. Powerful leaders promote themselves against each other, each with his ban of loyal followers. One of them is having an affair with his stepmother, and, instead of disciplining him, many in the church boast of his freedom in Christ to behave in such a way. Believers sue each other in secular courts; some like to habitually visit prostitutes. As a back lash against rampant immorality, another fraction in the church is promoting sexual celibacy- complete sexual abstinence for all believers- as the Christian ideal. Still other debates rage about how decisively new Christians should break from their pagan past. Disagreements about men’s and women’s role’s in the church add to the confusion. As if all this were not enough, alleged prophecies and speaking in tongues occur regularly, but not always in constructive fashion. A significant number of these immature Christians do not even believe in the bodily resurrection of Christ! As the new semester begins, I am entering into a new routine. God needs to be primary in my planning, if my priories are to line up with my professed beliefs. 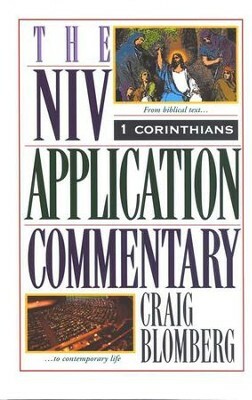 So, each day will begin with reading a section of the NIV Application Commentary: 1 Corinthians. To know about God is not the same thing as knowing God. We are created to be in relationship with him. Relationships, though, include knowledge. We know about the person that we love. God reveals who he is in Scripture. So, a big part of a growing relationship is increased knowledge through the reading of the Bible. 1 Corinthians is my book to study this Autumn. The above paragraph, written by Craig L. Blomberg, is helpful to see how relevant this ancient book is. The church he is imagining is the reality of the Corinthian church at the time of Paul’s first letter. I would invite you to join me in reading one entry from the commentary a day (except Sundays). Today, I started with the introduction, I will re-read it tomorrow. If you can get yourself a copy of the book, you can always just jump in wherever I am.